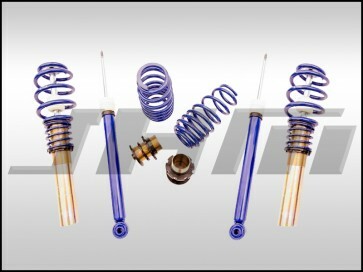 NOW AVAILABLE FROM JHM: Solo-Werks S1 Coilover Kits!!! The Solo-Werks S1 Coilover system is the best entry level coilover suspension that you can buy for your B8 Chassis Audi. These coilovers lower the ride height of your vehicle giving you both the aggressive look and increase in handling performance you get from lowering springs while also providing the added feature of height adjustability - all without costing much more than springs!!! **NOTE:** All lowering ranges are approximate and will vary depending on mileage, condition, and vehicle options. Solo-Werks provides a 3 year, limited warranty on their coilover systems to the original retail purchaser. This limited warranty covers defects in materials and manufacturing of the components of the Solo Werks Coilover Systems on street driven vehicles only. Installation or labor charges for removal, re-installation, or alignment are the responsibility of the end user and will not be covered or reimbursed by Solo Werks or any of its authorized agents, including JH Motorsports, Inc.